KATHMANDU, April 27: With the government agreeing to withdraw the decision to increase the number of local units in 11 tarai districts, the main opposition CPN-UML ended its obstruction of parliament on Wednesday evening, paving the way for deliberations on the constitution amendment bill tabled in the House. After brief deliberation, the House meeting decided to allow the lawmakers to register fresh amendments to the constitution amendment bill within three days. 'With the government and the agitating parties agreeing to endorse this amendment bill with revisions, the people in Madhes have already started celebrations. This bill is not against the national interests as claimed by the opposition,' said Law Minister Ajay Shankar Nayak addressing the House meeting. Ruling partners and agitating Madhes-based political parties have already agreed to endorse the amendment bill by May 2, revising some of its provisions. According to Minister Nayak lawmakers from the ruling parties will register amendments to the bill based on the agreements with the agitating Madhes-based political parties and the House will then endorse the bill. The government, however, faces challenges to get the amendment bill endorsed through the House as it requires a two-thirds majority which is difficult because the second largest party in parliament, the CPN-UML, strongly opposes the bill. During the deliberations on Wednesday, UML lawmakers Prakash Jwala, Rewati Raman Bhandari and Afilal Okheda strongly opposed the proposed amendment bill, saying some of its provisions are against national interests. Deliberations on the bill started in the House late evening after the government agreed to withdraw the decision to increase the number of local units in Madhes districts. Earlier in the afternoon, the Speaker had to halt the scheduled discussion in the House due to UML"s obstruction. The House meeting on Wednesday was postponed repeatedly, after a meeting between the ruling and opposition parties witnessed a heated debate. 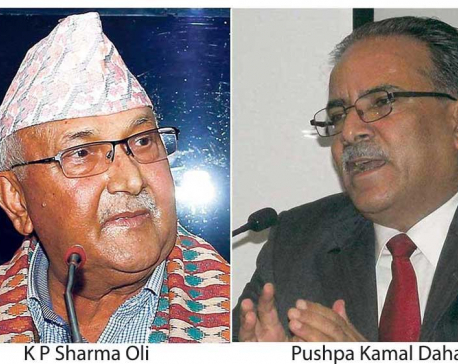 Ruling Nepali Congress (NC) President Sher Bahadur Deuba and UML Chairman K P Oli resorted to verbal altercation over the issue in the meeting, said the leaders attending the meeting. The UML had obstructed the House meeting on Tuesday as well. Though Deputy Prime Minister Kamal Thapa, while addressing the parliament meeting, argued that the government decision was aimed at bringing the agitating parties on board the election process, UML wasn"t convinced by Thapa"s answer. 'Though DPM Thapa said the government"s move was aimed at bringing the agitating parties on board the local poll process, his answer to the House about the unconstitutional move is not satisfactory,' said UML Chief Whip Bhanubhakta Dhakal in response. Subsequently, UML lawmakers rose from their seats to obstruct the meeting. Dhakal demanded that the government correct the "unconstitutional" decision of increasing the number of local units in 11 tarai districts. He claimed that the government decision to increase the number of local units after the political parties had finalized their candidates was a ploy against the local polls. The UML also accused the ruling coalition of keeping the opposition in the dark while forging agreement with the agitating parties on issues of national concern. Earlier in the meeting, DPM Thapa said that the government had decided to increase the number of local units in the disputed districts to create an environment for the local polls. 'I want to assure the House on behalf of the government that the condition of revising local units in the tarai is for ensuring the local polls and bringing the agitating parties on board the election process,' said Thapa. The UML had been obstructing the House meeting since the government tabled the constitution amendment bill, which was forwarded to the House amid objection from the main opposition.